With a dark amber colour and rich, but not overpowering taste, this honey is born from the nectar of one hundred flowers in the wilderness of fragrant, humid forest. It has the fresh and delicate scent of the mountains. Mielbio Organic Forest Honey is organic, gluten free and contains no genetically modified organisms. It is delicious as a simple breakfast spread or added to natural yoghurt and milk, and is excellent with Asiago cheese. A leader in Italyûûs organic food movement, the company also cares about people and nature, throughout farming, processing and marketing. It provides favourable working conditions, and uses recycling and renewable energy in its operations to reduce its environmental impact. Rigoni di Asiago is committed to offering quality ingredients and genuine flavours. Ripe fruit is selected, washed and frozen within hours of being harvested. Low-temperature processing methods preserve nutritional qualities of the basic ingredients as much as possible. An in-house lab runs quality checks at each stage of production from cultivation to packaging. 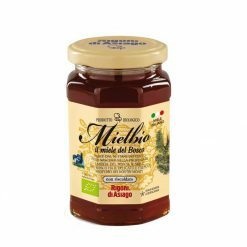 The leading brand of organic honey in Italy, Mielbio is the result of know-how passed down in the Rigoni family since 1923. It comes from only selected Italian beehives, and is a natural food par excellence. The low temperature process patented by Rigoni di Asiago enables vitamins, minerals, enzymes and organic acids naturally present in the honey to remain intact, as well as its natural anti-bacterial and antibiotic proper”ies. Thanks to this process, Rigoni di Asiago Honey is defined as raw. Honey also comes from Rigoni di AsiagoEEs trusted beekeeper partners. Located in protected and unpolluted areas in several Italian regions, the beehives are checked regularly to guarantee a flawless organic quality. They do not undergo any chemical treatment. As a result, bees are able to develop in a healthy environment covering several kilometres.